کار کودکان می‌تواند نشانی از «فقر جاری» بوده و به نوبه خود یکی از عوامل پدیدآورنده «فقر آتی» و نیز استمرار سیکل بسته فقر در خانواده به حساب آید. 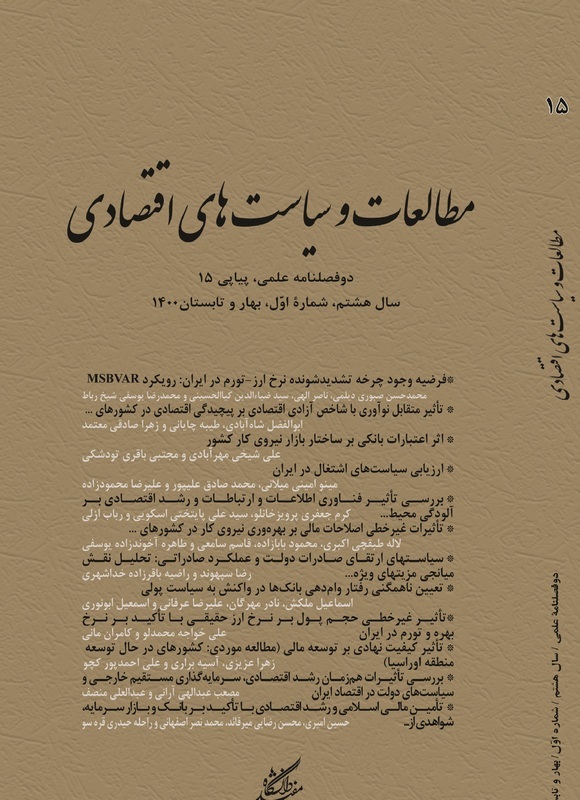 در این پژوهش، با استفاده از داده‌های طرح درآمد و مخارج خانوارهای ایران (1387) عوامل درون خانواده مؤثر بر کار و تحصیل کودکان با استفاده از مدل‌های پروبیت دوگانه ارزیابی می‌گردد. نتایج نشان می‌دهد که ویژگی‌های خانوارها در شکل‌گیری این پدیده مؤثر است. به طوری که عوامل درون خانواده مؤثر بر کار کودکان در ایران می‌‌تواند ناشی از برخی ویژگی‌های کودک (مانند، سن، جنس، تحصیلات، درآمد) و یا متأثر از ویژگی‌های پدر و مادر کودک (مانند، تحصیلات، درآمد و ساعات کار والدین) بوده و علاوه بر آن به دلیل برخی از ویژگی‌های خانوار (مانند، شهری یا روستایی بودن) باشد. Child labor is a sign of “current household’s poverty”, which in turn leads to “future poverty” and causes vicious circle of poverty in a family. This research aims to assess the intra-household factors that affecting the work and school attendance of children, by using Bivariate-probit models as a joint decision making of parents in Iran. We use households’ income and expenditure survey 2009 both for urban and rural areas. Our findings reveal that family background of children is among the main causes of child work decision in urban and rural families. More specifically, parental age, schooling, wage and non-labor earning are the main determinants of child’s time allocation. Furthermore, child gender, her age and region of residence are observed as significant factors which cause being a child labor. دو هفته نامة فرهنگ و پژوهش؛ اردیبهشت‌ ماه، 1382، شماره 108. مرکز آمار ایران؛ نتایج سرشماری نفوس و مسکن سال 1375، تهران، انتشارات سازمان برنامه و بودجه، 1388. مرکز آمار ایران؛ نتایج سرشماری نفوس و مسکن سال 1385، پایگاه اطلاعات مرکز ملی آمار (درگاه ملی آمار)، 1388. Aghion, P. Caroli, E. and Garcia-Penalosa C; 1999,"Inequality and Economic Growth: The Perspective of the New Growth Theories", in Journal of Economic Literature, Vol. 37, pp. 1615-1660. Anker, R. and Mekas B; 1996, "Economic Incentives for children nad families to eliminate or educe childlabour", International Labor Office, Geneva. Bachman, S. L; 2000a, "New Economics of Child Labor: Searching for Answers Behind the Headlines", in Journal of International Affairs, Vol. 53, No. 2 (spring), pp. 545-572. Basu, Kaushik and Phang H. Van; 1998, "The Economics of Child Labor", American Economic Review, vol. 88, No. 3, (June) pp. 412-427. Basu, Kaushik and Ranjan Ray; 2001, "The Collective Model of the Household and an Unexpected Implication for Child Labor: Hypothesis and an Empirical Test", Working Paper 2813. Washington, D.C: The World Bank. Benabou, R; 1996, "Inequality and Growth", in NBER Working Paper, No. 5658 (July). Bhalotra Sonia and Heady Chirist; 2000, "Child Farm Labour: Theory and Evidence", Development Economics Discussion Paper, LSE STICERD Reasearch, No. DEDPS 24. Bourguignon, Francois and Pierre-Andre Chiappori; 1994, The Collective Approach the Household Behavior, In Richard Bludell, Ian Preston, and Ian Walker, eds., the Measurement of Household Welfare. U.K: Cambridge University Press. Chaudhri, D.P. and Wilso, E. J; 2002, "Nutritional Poverty, School Education and Supply of Child Labour: Explorations with States, Districts and Household Data for Rural India". Ramachandran and Massün, eds. 113-42. Chiwaula, L; 2010, "Household Poverty and Child Labor Decisions in Malawi", Research in Labor Economics 31, pp. 33-51. Cigno, A. F. C. Rosati, and Z. Tzannatos; 2000, "Child Labor, Nutrition and Education in Rural India: an Economic Analysis of Parental Choice and Policy Options", World Bank Working Paper. Cigno, Alessandro, Furio, C. Rosati and Zafiris, Tzannatos; 2001, Child Labor Handbook, Washington: The World Bank, manuscript. Dayioglu, Meltem and Assa, Ragui; 2002, "The Determinants of Child Labour in Urba Turkey", ERF Working Paper Series No. 0302. Diamond, Charles and Tammy, Fayed; 1998, "Evidence on Substitutability of Adult and Child Labour", The Journal of Development Studies, vol. 34, No. 3 (February), pp. 62-70. Edmonds, Eric and Carrie Turk; 2002, "Child Labor in Transition in Vietnam", Working Paper 2774, February. Washington, D. C: The World Bank. Edmonds, Eric V. and Schady, Norbert; 2010, "Poverty Alleviation and Child Labor", August 24. Emerson, Patrick M. and André Portela Souza; 2002, "Birth Order, Child Labor andSchool Attendance in Brazil". Manuscript, (May). Eswaran, M; 2001, "The Empowerment of Women, Fertility, and Child Mortality", Journal of Population Economics (forthcoming). Folbre, N; 1986, "Hearts and Spades: Paradigms of Household Economics", WorldDevelopment 14, 245-255. Francavilla, Francesca. And Giannelli, Gianna Claudia; 2007, "The Relation between Child Labour and Mothers’ Work: The Case of India", IZA Discussion Paper No. 3099, October, Germany. Fyfe, Alice; 1989, Child Labour, Polity Press. NewYork. ________ ; 1993, Child Labour: Aquid to Project Design, Geneva International Labour Office. Galli, Rossana; 2001, "The Economic Impact of Child Labour" University of Lugano, Switzerland, Decent Work Research Programme, http//:www.ilo.org/inst. Haddad, L. and J. Hoddinott; 1994, "Women’s Income and Boy-Girl Anthropometric Status in Cote d’Ivoire", World Development 22, 543-553. Hoddinott, J. and L. Haddad; 1995, "Does Female Income Share Influence Household Expenditures? Evidence from Cote d’Ivoire" Oxford Bulletin of Economics and Statistics 57, 77-96. ILO; 1996, "Child Labour: Targeting the Intdeable", Geneva: International Labour Office, P.405. International Labour Organization (ILO); 2006, "The end of child labour: Within reach", Geneva. Jacoby, Hanan G. and Emmanuel Skoufias; 1997, "Risk, Financial Markets, and Human Capital in a Developing Country", Review of Economic Studies, vol. 64, No. 3, pp. 311-335. Kanbur, R. and Haddad, L; 1994, "Are Better-off Households more Equa l or Less Equal? ", Oxford Economic Papers, vol. 46, pp. 445-458. Khanam, Rasheda; 2006, "Child labour and school attendance: evidence from Bangladesh", MPRA Paper No. 6990. Krueger, Alan B; 1996, "Observations on International Standards and Trade", NBER Working Paper No. 5632, Cambridge, MA: National Bureau of Economic Research, pp. 24-25. Lieten, G.K; 2003, "The Causes for Child Labour in India: the Poverty Analysis", Indian Journal of Labour. Manser, M. and M. Brown; 1980, "Marriage and Household Decision Making: a Bargaining Analysis", International Economic Review 21, 31-44. Marshall, A; 1920, "Principles of Political Economy", London: MacMillan, 8th Edition. Marx, Karl, 1867; Capital: A Critique of Political Economy. Mendelvich Elias; 1979, "Child Labour", International Labour Review, Vol. 118, No. 5. Moehling, Carolyn; 1995, "The Intrahousehold Allocation of Resources and theParticipation of Children in Household Decision-Making: Evidence from EarlyTwentieth Century America", Northwestern University, mimeo. Parsons, Donald O. and Claudia Goldin; 1989, "Parental Altruism and Self-Interest: Child Labor Among Late Nineteenth-Century American Families", EconomicInquiry, vol. 27, No. 4, October, pp. 637-659. Patrinos, Harry Anthony and Psacharopoulos, eorge; 1997, "Family size, schooling and child labor in Peru-An empirical analysis", Journal of Population Economics (springer). Pörtner, Claus Chr; 2001a, "Children’s Time Allocation in the Laguna Province, thePhilippines", The World Bank (September). Ranjan, Priya; 2001, "Credit Constraints and the Phenomenon of Child Labor", Journal of Development Economics, vol. 64, issue 1, pp. 81-102. Ray, Ranjan; 1999, "How Child Labour and Child Schooling Interact with Adult Labour", Working Paper 2179, (September). Washington, D.C: The World Bank. Robles-Vásquez, Héctor and David G, Abler; 2000, "Education and Labor ForceParticipation by Mexican Children during Structural Adjustment: A MicroeconomicAnalysis", Working Paper 00-05. University Park, PN: Population Research Institute (April). Rodgers, Gery and Standing; 1981, "Economic Roles of Children in Low-Incom Countries", International Labour Review, Vol. 120. No. 1. Rogers, Carol and Swinnerton, Kenneth; 2003, "Does Child Labor Decrease When Parental Incomes Rise? ", Journal of Political Economy. Forthcoming. Rosati, F. C and Tzannatos Z; 2000, "Child Labor in Viet Nam: An EconomicAnalysis", World Bank Working Paper: Washington DC. Rosenzweig, M. R. and R. E. Evensson; 1977, "Fertility, Schooling, and the Economic Contribution of Children in Rural India: An Econometric Analysis", Econometrica, vol. 45, No. 5, pp. 1065-1079. Skoufias, Emmanuel; 1995, "Household Resources, Transactions Costs, and Adjustment through Land Tenancy", Land Economics, vol.71, No. 1, pp. 42-56. UNESCO Institute for Statistics (UIS); 2005, "Children out of school: Measuring exclusion fromprimary education", Montreal. United Nations; 2007, "The millennium development goals report 2007", New York.